One thing you won't ever find on this site is a section called "Testimonials", because this is taboo for Speech Pathologists, and someone from Speech Pathology Australia would be round to my clinic with a big stick in no time. Speech Pathologists have to work in a way that's consistent with the scientific evidence. Testimonials are anecdotes about a service/product, to which the proper scientist's stern response is: "The plural of anecdote is not data". Too often, people purveying snake oil use testimonials to promote their products or services, so something tends to go down in my estimation if its website does include testimonials, and sinks even lower if there is little or no information about the research on which the product or service is based. However, I think I can get away with sharing a lovely email comment I've received, even though it seems dangerously close to a testimonial, because it's not about me, it relates to a product I didn't make up and don't sell. I just told people about it. I think the comment (which I'll tell you in a sec) makes a simple but very important point, which is that decodable books can be great fun. Too often people jump to the conclusion that they are boring and not-fun, without actually taking the time to listen to children reading them, and find out what they think. In my experience, children who've been struggling with learning to read really like reading decodable books, whether they're funny or not, because they can do it independently. After having experienced a lot of failure, success at getting the words off the page is in itself enjoyable and exciting. If a book contains funny content (and remember that children's idea of funny is different from adults'), that's the icing on the cake. I was working with a Grade 1 boy this morning and had aimed to get him to to read two Sounds Write readers, but he insisted on reading five of them, and would have kept going if we hadn't run out of time. He very much liked the book I wrote about in this earlier blog post, where children trick each other into sitting on wet play equipment. Wet bums! Hahahahahahahaha! To a seven-year-old, hilarious. 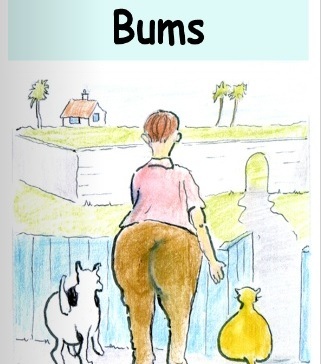 "The SPELD reader in group 3 called "Bums" is the funniest reader I have ever seen! My children love it, and I have never ever seen kids want to read and re-read a reader so many times. It was read to Grandma, and she was most amused!" So if anyone tells you that decodable books are boring and that children don't enjoy reading them, ask them to observe any child under about age nine reading "Bums" to Grandma, and see if everyone doesn't laugh their heads off. You can click here to read it yourself, but please put your childhood-scatalogical-humour hat on first. ROFL to bums, I say. This entry was posted in books, Fun, phonics activities on March 19, 2013 by alison.